In 2013’s final installment of the Women Who Rock series, No Country favorite, Anna Haas, has curated a spectacular night of music that focuses on the fierce, female side of Nashville’s ever-increasingly eclectic voice. This Friday night at the High Watt will, of course, include Anna and her band, The Effect, as well as the new-t0-Nashville-via-Chicago, Gina Venier & The Gentlemen, plus Jessica Breanne’s band, The Electric Hearts, as well as the brand new all-girl a cappella act, the seriously fatale, Forte Femme. Tickets are just $10 in advance and available here. It’s 18+, doors at 7 p.m., and the show gets started around 8. Tell everyone on Facebook to find you there! This week, we’ll be spotlighting a different artist each day leading up to the year-end event. Yesterday, we kicked things off with newcomer, Gina Venier, in a special interview conducted by WWR host, Anna Haas and today Anna does the honors again as we help you get to know the lovely ladies of Forte Femme – including a peek at their brand-spanking-new music video! Anna Haas: What inspired you to come together to start Forte Femme? Forte Femme: Most of us used to sing together in college–some of us were even in an all-female a cappella ensemble. Even though a few of us have been pursuing individual music careers since then, we missed singing as a group and wanted to come together to make something creative and fun. There’s also something special about a cappella music…it takes a specific kind of focus and vocal precision that we enjoy as singers. Luckily for us, it seems like people are really starting to pay attention and show some love to the a cappella world! AH: Any up-and-coming/indie artists that excite you? FF: Nashville in particular is filled with incredible and exciting talent… we really love locals like Ruby Amanfu and Apache Relay, and outside of Nashville some of our favorites are The Broadcast, Son Lux and Beach House. Of course, we support each other, too: Beta and Anna form Youngest Daughter and Cristina’s in Fin, and many of us have exciting solo projects on the horizon! AH: What do you think are some of the best things to do in Nashville around the holidays? FF: The Nutcracker with the Nashville Ballet and Symphony is a classic. We’re also suckers for Christmas lights, and Opryland is an obvious favorite, but some of the best displays are in neighborhoods. There’s one on Sunnyside Dr. in Brentwood every year with a billion lights that is awesome. I mean, last year they had a light-up Santa flying a helicopter. Come on. AH: What kind of music can we expect to hear from your group at this Friday? FF: A little bit of everything! We haven’t arranged any originals (yet), but we’ve revamped some songs everyone will know. Listen for some Justin Timberlake, Civil Wars, and Kimbra. And we can’t play a show in December without throwing a little Christmas ditty in there! AH: Who has put on the most fun show you’ve ever been to? FF: We each have favorites. Kara and Lauren recently saw Rufus Wainwright at the Ryman, and at the end of the show he put on a toga and invited the audience on stage to dance with him and a giant foam sandwich. It was a bizarre and amazing moment. Imogen Heap at the Ryman was also incredible– her presence on stage and sheer talent was so amazing to watch. And Fleet Foxes… also at the Ryman! So basically any show at the Ryman. AH: Do you all feel that being a women in the music industry provides any particular challenge? FF: Absolutely, there’s always a challenge with being a woman in an entertainment field. Actually, Rashida Jones has recently re-sparked a debate about women in music and the problem of hypersexuality…I think she called it the “pornification of pop stars.” Whatever side of the debate you’re on, there’s no denying that women are definitely under more pressure to present themselves and their bodies in a sexualized manner, in order to achieve success. Fortunately, we as a group have creative control over our image and feel that we don’t have to be naked to make and share great music. FF’s Kara: I’m so excited that we are part of an event that celebrates bold female musicianship. There’s something special about making music in the company of powerful women, and with Forte Femme, there’s also something special about using only our voices as instruments. 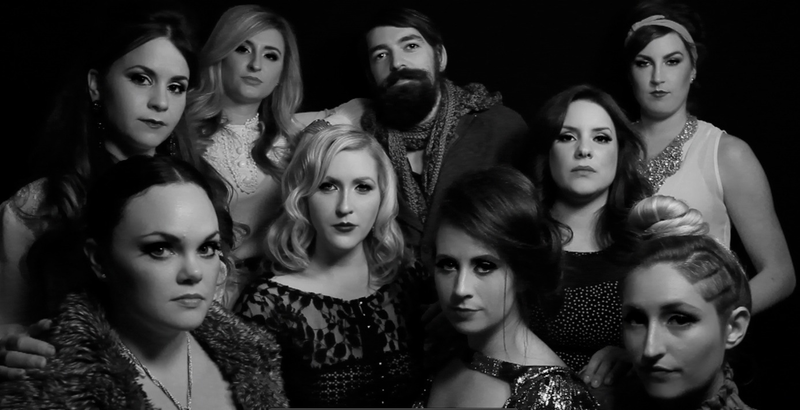 Female a cappella groups are often criticized for not having a low, male bass as a foundation, but I think we sound pretty fantastic without one, if I do say so myself. Plus, we’ve recently welcomed Mark McLemore to provide some vocal percussion. He’s talented and has an awesome beard, so he’s definitely adding a little male energy to compliment us! AH: Does being in a group with 8 women provide any particular challenge? FF: No! We all get along perfectly… all of the time… The truth is, we are eight independent, opinionated women, and there are definitely moments of creative differences. We handle those moments with grace and love…er, mostly. AH: What’s the best part about being in a group with 8 girls? FF: Despite the tense moments that are bound to happen, we really are all good friends. The eight of us together can get ridiculous, and we’ve laughed to the point of tears numerous times. Right now our rehearsals are probably about half singing and half getting distracted and telling stories and giggling. Hey, we’re working on it! AH: What are you working on/promoting at the moment? Any new projects? FF: We just released a music video of our Christmas arrangement of “O Come, O Come Emmanuel.” (Catch that above!) We are always arranging new music, so stayed tuned! FF’s Kara: We are excited about plans for the future. We’ve just recorded our first song together (Cristina and Alana did a sweet arrangement of a traditional Christmas tune) and filmed a music video. I’d love to do an entire album with the girls, and doing some touring is definitely in the plans. We’d also love to collaborate with other local artists—the collaborative spirit is really something that drives our group. We don’t have a front-woman, and we’re very conscious about featuring each member in our songs. We all have unique talents that we’re bringing to the table. Some of us are organized and business minded; others are truly creative spirits, which makes for a nice balance. It’s part of the reason we are really drawn to the Women Who Rock series—there’s such a tendency to pit women against each other in a creative industry, and it’s so nice that there is a platform like WWR for female performers that is supportive rather than competitive. AH: Is there any particular cause or charity that you all stand behind? FF: As a female group, we feel strongly about the creation of space for girls and women to express themselves freely and artistically. There are great programs in Middle Tennessee that do just that: Act Like A GRRRL (http://actlikeagrrrl.org) and Southern Girls Rock n Roll Camp (http://sgrrc.com) are two wonderful organizations that come to mind. We also hope to lead by example with our creative endeavors. Several of our members are also actively involved in Timothy’s Gift, which seeks to bring hope back into the lives of all those behind prison walls– inmates and prison staff alike, and to assure them that they are loved. AH: What one piece of advice would you give to anyone trying to start a new music group or band? FF’s Kara: Do your thing, because no matter what it is, someone is going to love it and someone will hate it. You can’t please everyone, so do what makes you happy and what fulfills you creatively– and put your heart and soul and guts into it. From Alana: Make sure you all have common goals that you are working toward and share the same level of passion for what you are doing. Having people you genuinely enjoy being around is a major plus! Oh, and make sure you’re good at what you do, haha! 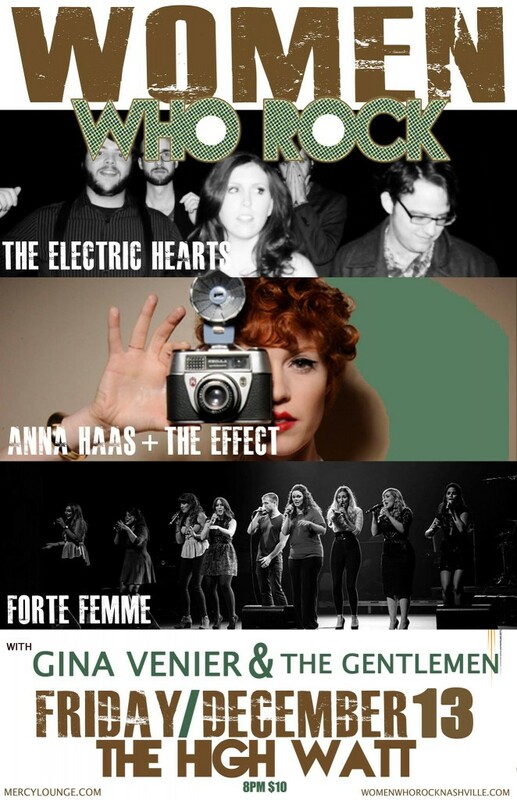 Catch Forte Femme (plus all the other awesome acts) this Friday at the last Women Who Rock of 2013 at the High Watt – grab tix now! Jessika is that rarest of Nashville music scenesters - a native, without recording industry aspirations. She's not married to a musician and her parents aren't industry types. She just loves music and likes to write about what excites her.